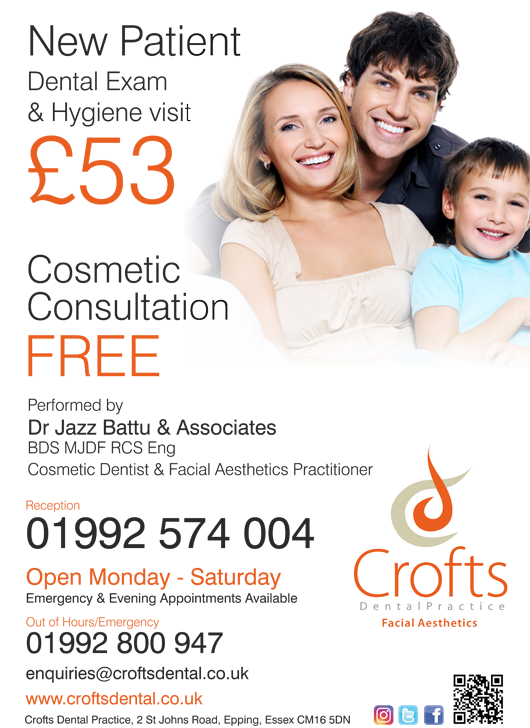 At Crofts Dental Practice we welcome new patients of all ages for general, restorative and cosmetic dentistry. We have a special offer for new patients, with your initial examination PLUS a hygiene visit costing just £48 in total. We are also experienced in treating nervous and phobic patients and have a range of treatment options available. Even if fear of the dentist has prevented you from seeking treatment for many years, we believe we can help you. We treat all of our patients in a caring, non-judgemental way and see patients with various dental problems and issues. Whatever your concern and whatever the condition of your teeth, we will treat you with respect, dignity and care – we’re here to help. For new patients we offer the chance of a free consultation, during which you will be welcomed to the practice by a member of our friendly team and will have a chance to meet the dentist for a free-of-charge conversation about expectations and what treatments are possible. Unlike other practices that have a treatment co-ordinator as a first point of contact, at Crofts Dental Practice we offer the chance to meet directly with the dentist who will be treating you. The whole team is always open to suggestions and will listen carefully to what each patient wants, before working with you to achieve it. When you come to us for treatment you can make your first appointment straight away, and won’t have to wait long to see a dentist. Our whole team always do their best to run on time, which means you will almost never have to wait too long after you arrive for your appointment. The waiting room is relaxed and welcoming, with tea, coffee and other refreshments available for you while you wait. At your first appointment your dentist will find out what has brought you to the practice and will carry out a full examination of your teeth, gums and surrounding structures, including an oral cancer check as standard. We will take x-rays as necessary to aid with diagnosis, and will present our findings to you in a detailed treatment plan, including all options. If you are interested in cosmetic dental treatment, our advanced computer systems can help you to know what to expect from treatment before we get started. To book your first appointment, please contact reception on 01992 574004.